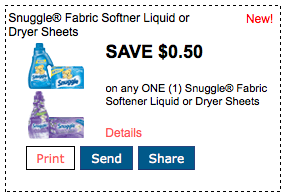 Home > Printable Coupons > New Redplum Printables: Coupons for Snuggle, Chapstick, Wisk & More! New Redplum Printables: Coupons for Snuggle, Chapstick, Wisk & More! It’s Sunday and that means Redplum has restocked their page with new printable coupons! About half of what’s there is a carry-over from last week, but all the new ones are listed below! I’m loving the two laundry coupons! Find more high value coupons in the coupon database!